1. High hopes for Netflix: Netflix (NFLX) is set to report first quarter earnings after the closing bell on Monday, and Wall Street is expecting a blockbuster. The company has had a stellar year so far: Its stock is up more than 60%. Analysts are expecting a 40% increase in sales and a 60% jump in profit compared to a year ago. They are forecasting Netflix to have gained 7.5 million more subscribers since the previous quarter. 2. WPP CEO out: Martin Sorrell, the founder and CEO of the world's biggest ad agency WPP, is leaving the company amid an investigation into alleged "personal misconduct." The British CEO announced his departure in a letter to WPP (WPP) employees Saturday. The company said earlier this month it had hired an independent counsel to conduct a probe into the alleged misconduct by Sorrell. The hunt for a successor starts now. Sorrell spent three decades building the company and analysts are worried he will be hard -- if not impossible -- to replace. WPP shares fell nearly 2% in early London trade. 3. 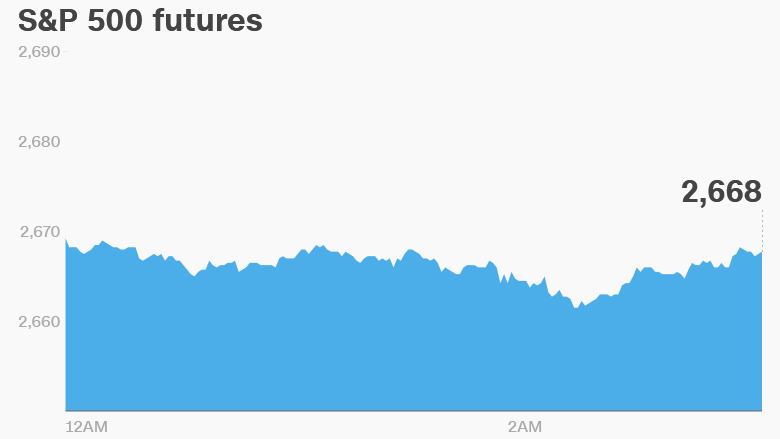 Russia sanctions: Russian stock markets opened lower on Monday amid fears of more U.S. sanctions. The Trump administration imposed sanctions against seven Russian oligarchs with ties to President Vladimir Putin along with 12 companies they own or control earlier this month. Further sanctions on Russia could be announced as early as Monday. US Ambassador to the UN Nikki Haley told CBS Sunday the Treasury Department will announce new sanctions against Russia on Monday. She said the sanctions will go "directly to any sort of companies that were dealing with equipment related" to Syrian President Bashar al-Assad. A source familiar with the matter told CNN that more than a dozen Russian entities, including banks and equipment suppliers, are being looked at and at least several are expected to be sanctioned. Shares in Rusal, the industrial conglomerate owned by sanctioned oligarch Oleg Deripaska, plunged 30% in Hong Kong on Monday. The stock has now lost 70% since the sanctions were first announced. The Russian ruble was 0.2% lower against the dollar, and is now 15% down since the oligarchs were sanctioned. Russia's parliament could vote Monday on retaliatory measures. 4. Global market overview: US stock futures were pointing higher early on Monday. US oil futures dropped 1.6% early on Monday. Brent crude, the international oil prices benchmark, was also sharply lower on Monday. The falls followed limited strikes by the United States, the United Kingdom and France against targets at three sites in Syria on Saturday, following an alleged chemical weapons attack on civilians in the Syrian capital Damascus. Oil prices reached the highest levels since 2014 last week, as investors worried about the conflict in the Middle East. "Many feared the attack would probably lead to a broader confrontation ... the fall in oil prices is another sign of relief, after the geopolitical tensions last week drove Brent to its highest levels since 2014," Hussein Sayed, chief market strategist at FXTM, wrote in a note for clients. 5. Friday market recap: The Dow Jones industrial average and the Nasdaq both closed 0.5% lower on Friday, while the S&P 500 dipped 0.3%. 6. Earnings and economics: The Census Bureau will release March retail sales statistics at 8:30 a.m. ET. Bank of America (BAC) is set to publish its latest results before the opening bell on Monday. Investors are hoping the bank will follow the trend set by rivals JPMorgan Chase (JPM), Citigroup (C) and Wells Fargo (CBEAX) -- all three reported earnings topping analysts forecasts on Friday.